Kids and dogs just seem to go together. Unfortunately, the majority of young Airedales come to rescue from families with small children. Typical reasons for surrender include: Airedale is play biting, jumping on, knocking down children. Child has been injured by dog and is afraid. Airedale has bitten child, or child's friends. Toddler pursues dog and dog is growling, snapping at child. Child is allergic to dog. School and other activities leave no time for dog, dog is always alone. Dog is food oriented and growls at children with food. Alpha dog is challenging child. Children leave the gate/door open, and dog runs away. Our experience in re-homing over 2000 Airedales proves that Airedales typically do better in homes without small children. Airedales are LARGE dogs who play roughly, they can easily hurt a child without meaning to! Busy two income families with children rarely have the time to obedience train and provide adequate exercise for a young Airedale. Because we are a non-profit rescue group placing adult dogs in homes, child safety and the potential for lawsuits is a major concern to us. For these stated reasons, ATRA will not place young Airedales in homes with small children. 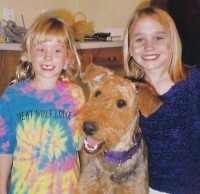 Homes with older children will be considered for Airedales with a documented positive past history with children.